The lion - Panthera Leo - Is one of the big cats in the genus Panthera and a member of the family Felidae. With some males exceeding 250 kg (550 lb) in weight, it is the second-largest living cat after the tiger. (It is by far the biggest cat species found in Africa) Lions were once spread as far as from Britain to the Southern parts of Russia. Throughout Eurasia and India all the way down to the Southern tip of Africa. In North-America and the Northern Parts of South-America there was the American Cave Lion up till about 11,000 years ago. Now you only find them in Sub-Saharan Africa and in Asia with an endangered remnant population in Gir Forest National Park in India. The lion was once the most widespread large land mammal after humans. This status now probably belongs to Cattle. Can you think why? Is there a relationship? 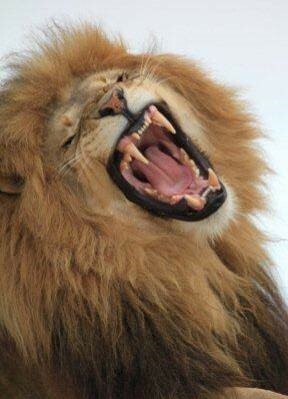 A lion’s roar can be heard at 8km (5miles) away and can reach 114 Decibels at 1meter. At a 116dB the human body starts to perceive vibration from lower frequencies. So, standing next to a Lion roaring is bound to move you. At Jukani, one often experiences this sound in stereo down Lion Alley.